Tasty spicy subz pullao is a Indian recipe. Its very yummy and tasty. 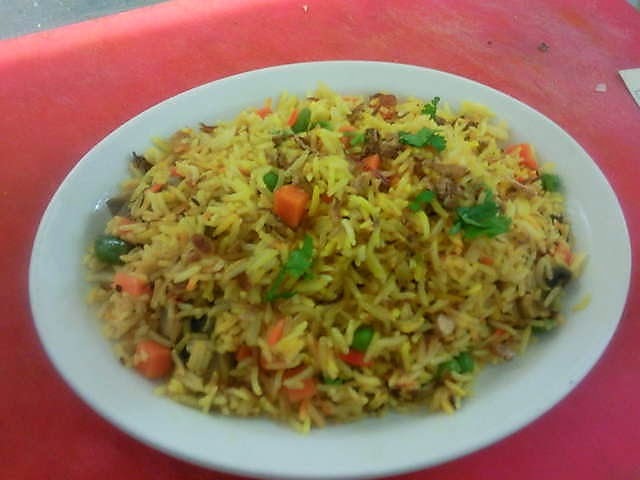 It is a full of nutrients and very healthy meal.Here a two simple methods to make this subz pullao. To make a homemade subz pullao, take a broad micro proof dish, put all the ingredients except rice. Microwave covered for 3 minutes. Now add the rice and 2 cup hot water in it . To prepare a subz pullao in a cooker, all the ingredients are same the only difference is to make it.Here are some simple steps to make it in a cooker. To make this subz pullao, take a cooker, add oil, cumin seeds and finely chopped onions. Cook it till onions brown. Now add ginger paste, peas ,haldi, cauliflower florets, potato, carrot, capsicum, red chilli powder, salt, tomato, garam masala, black pepper powder, coriander leaves. Now add rice and water.